-Is a platform style bed with generously proportioned out turned rails that provide handy storage for small and useful items. -Finished in high gloss Polyester - "as smooth as glass as hard as nails". -Headboard is shown in crown cut and book matched Wenge veneer with a Wenge veneered and edged sub-frame. Priced as shown including the Vitafoam Multizone Reflexion Mattress, delivered and installed and inclusive of VAT £1940.00. Mattress size - 2000mm X 1500mm. 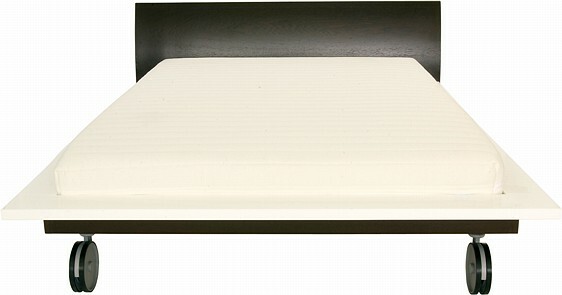 The Polyester Bed can be supplied in Black, White or any colour in between, along with the veneer of your choice. Polyester is technically a very difficult and time-consuming finish to apply. It is a high build high gloss lacquer often described "as smooth as glass as tough as nails". It has an innate ability to reflect light and shapes, this is what gives it, its true beauty. To achieve our polyester finish we apply a total of 9 coats in all, and all of these need intermediate treatments. These efforts are well worthwhile because the finished qualities of polyester are extraordinary it is very hard. In fact it cannot be remove by paint strippers. This is because it cures though a direct chemical hardening rather than relying on the release of a solvent.